Jews (Ukrainian: zhydy, ievreï). Jews first settled on Ukrainian territories in the 4th century BC in the Crimea and among the Greek colonies on the northeast coast of the Black Sea (see Ancient states on the northern Black Sea coast). From there they migrated to the valleys of the three major rivers—the Volga River, Don River, and Dnieper River—where they maintained active economic and diplomatic relations with Byzantium, Persia, and the Khazar kaganate. The latter empire consisted of Turkic tribes that converted to Judaism in about 740 AD. In the aftermath of Khazaria's conquest in 964 by the Kyivan prince Sviatoslav I Ihorevych, Khazarian Jews settled in Kyiv, the Crimea (see Karaites), and Caucasia. Throughout the 11th and 12th centuries Khazarian Jews steadily migrated northwards. 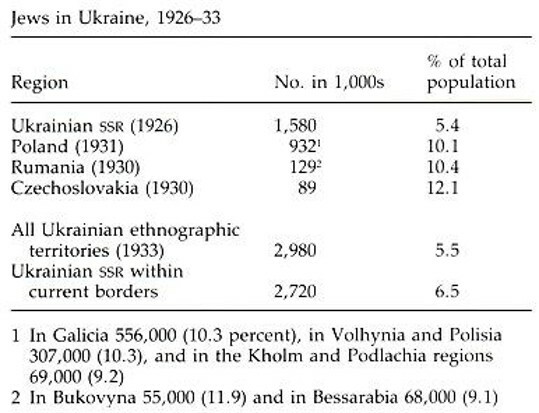 In Ukraine the Jewish population developed a distinct presence. In Kyiv they settled in their own district called Zhydove, the entrance to which was called the Zhydivski vorota (Jewish gate). Jews fleeing the Crusaders came to Ukraine as well, and the first western-European Jews began to arrive from Germany, probably in the 11th century. Jews began taking advantage of the new professional and economic opportunities in the frontier territories of Ukraine. As Polish and Lithuanian nobles accumulated more land, Jews came to act as their middlemen, providing indispensible services to the absentee and local lords as leaseholders of large estates, tax collectors (see Tax farming), estate stewards (with the right to administer justice, including the death penalty), business agents, and operators and managers of inns, dairies, mills, lumber yards, and distilleries. In trade, they supplanted Armenians and competed with urban Ukrainians. Jews came to be perceived as the immediate overlords of the peasantry and the most important competitors to the urban Christian Orthodox population. Under Nicholas I (1825–55) official persecution of the Jews increased dramatically. Of the 1,200 laws affecting Jews between 1649 and 1881, more than half were instituted during his reign. Among these provisions were compulsory military service for Jews (1827), including the conscription of children; expulsions from cities (Kyiv, Kherson, and Sevastopil); abolition of the kahal (1844); banning of the public use of Hebrew and Yiddish; aggressive conversion measures; and further travel and settlement restrictions (1835). In 1844 a decree was issued that created new Jewish schools similar to the parish and district schools and that aimed to assimilate the Jews. 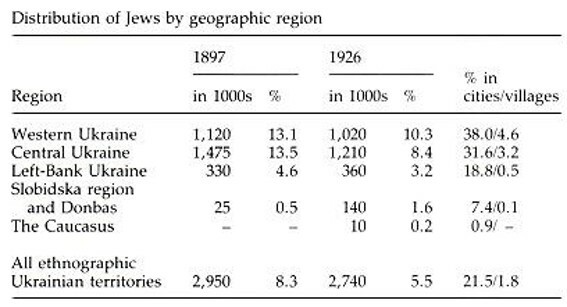 In Western Ukraine during the interwar period strong economic competition from Ukrainian co-operatives and from private commercial and industrial firms eroded the economic base of Jewish life in Poland, Czechoslovakia, and Rumania. The Polish government, and such Polish anti-Semitic groups as Rozwój, initiated anti-Jewish measures and activities. Despite the perception of economic antagonism between Jews and Ukrainians, there was some political co-operation: eg, in the 1922 and 1928 elections to the Polish Sejm, when Ukrainian and Jewish parties joined the coalition Bloc of National Minorities, and in the elections to the Czechoslovak and Rumanian parliaments. Repressive Polish measures against Ukrainians and the co-operation of some Jewish leaders with the Polish government led to resentment of the Jews. The German occupation of Ukraine during the Second World War—and, indeed, the entire war period—was a tragedy for Ukrainian Jews. Within the enlarged 1941 boundaries of the Soviet Union, 2.5 of the 4.8 million Jews were killed. In Western Ukraine only 2 percent (17,000) of the entire Jewish population survived. The destruction of Jews began in fall 1941, initially in central Ukraine and then in Western Ukraine. In Kyiv alone, 35,000–70,000 Jews were murdered at Babyn Yar. Mass murder of Jews was carried out throughout Ukraine in 1942–4. Apart from the involvement of individuals and some organized auxiliary units, the Ukrainian population did not take part in these genocidal actions. Despite the penalty of death for aiding Jews, a number of Ukrainians, among them Metropolitan Andrei Sheptytsky, tried to save Jews. Cultural life. From the very beginning of mass Jewish settlement in Ukraine, Jewish cultural and religious life was highly developed. The impressive stone synagogues throughout Ukraine serve as interesting historical monuments to Jewish material culture. The more notable ones, such as those in Volhynia (in Dubno, Lutske, and Liuboml), date back to the 16th–18th centuries. 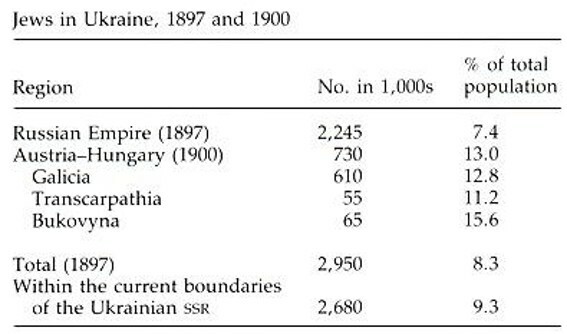 The Cossack uprisings of the 17th century, the destruction wrought by the Cossack-Polish War of 1648–57, and the general social and economic dislocations of the era initiated a period of great change for the Jewish population of Ukraine. Many Jewish scholars fled to the West, where they founded Talmudic centers in Holland, Germany, and Bohemia. Religious disillusionment spread and many Jews sought solace in a variety of ascetic or mystical movements. Hasidism, which was founded in Ukraine by Israel Ba'al Shem Tov, became the dominant religious trend in Western Ukraine. In the late 18th century the Haskalah or Enlightenment movement, inspired by Moses Mendelssohn, emerged. Adherents of this movement sought a synthesis of Jewish religious tradition with the demands of modern life. The Enlightenment movement later fostered the spread of Zionism, which had many adherents in Ukraine. In the Ukrainian SSR during the period 1923–34, Jews benefited from the granting of national rights and freedom for cultural development. Yiddish was recognized as an official language and used in administrative matters in Jewish soviets. Many Jewish periodicals were established; eg, Stern, the official organ of the Central Committee of the Communist Party of Ukraine and the All-Ukrainian Council of Trade Unions. All laws and government directives were also published in Yiddish. 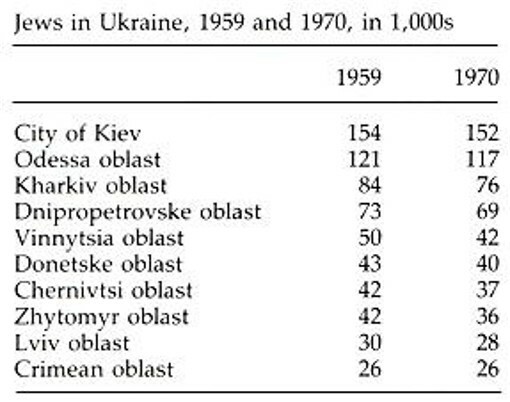 In the Ukrainian SSR in 1925 there were 393 trade and technical schools in which the language of instruction was Yiddish, attended by 61,400 students or one-third of the total Jewish student population. There were four Jewish pedagogical institutes and separate departments in the Institute of People's Education in Odesa. In 1928, 69,000 students attended 475 Jewish schools, and by 1931 there were 831 schools and 94,000 students. The closing of Jewish schools began in 1933–4, at the same time as the abolition of Ukrainization. By the start of the Second World War, the Jewish educational system had, for all practical purposes, been abolished.